Today’s goose post features shocking questions about the truthfulness of a respected and beloved blog—Ferrebeekeeper! That’s right; this very site, an esteemed font of knowledge which you regularly tell all your friends to read (right? ), has been caught in the midst of a scandal which spans the centuries…the millennia even! This mysterious controversy encompasses the greatest family of pharaohs ever, an enigmatic nineteenth-century archaeologist, and the fundamental meaning of art and objects. At the center of the swirling allegations lies the enigma behind the identity of a pair of geese. It all began with this post about an ancient Egyptian masterpiece, the famous goose frieze from Nefermaat’s tomb (Nefermaat being a nobleman of Egypt’s renowned Fourth dynasty). The geese in that ancient picture are gorgeous, they look like real birds which might hop down from the forty-six-hundred year old artwork and open up their beaks begging for corn (a fact appreciated by aesthetes among Ferrebeekeeper readers—as you can see in the original comments). However after I posted the article, cracks also began to appear in the story. Sharp-eyed readers wrote in with questions about my ornithology. There are three pairs of geese in the painting: a pair to the left, a pair to the right, and a split pair grazing, like bookends, on each side. With unwarranted ambiguity, I identified the birds as Egyptian geese (Alopochen aegyptiacus), based on the bird identification in an essay I had read concerning the paintings (and also based on the fact I wanted to write about a certain breed of domesticated geese). I was wrong to be so blithesome, for it is extremely clear that the two center pairs are very different species. The split pair may or may not be the same species as the pair on the left. Juvenile Egyptian Goose (Alopochen aegyptiacus). Note the complete dissimilarity to the painting above. 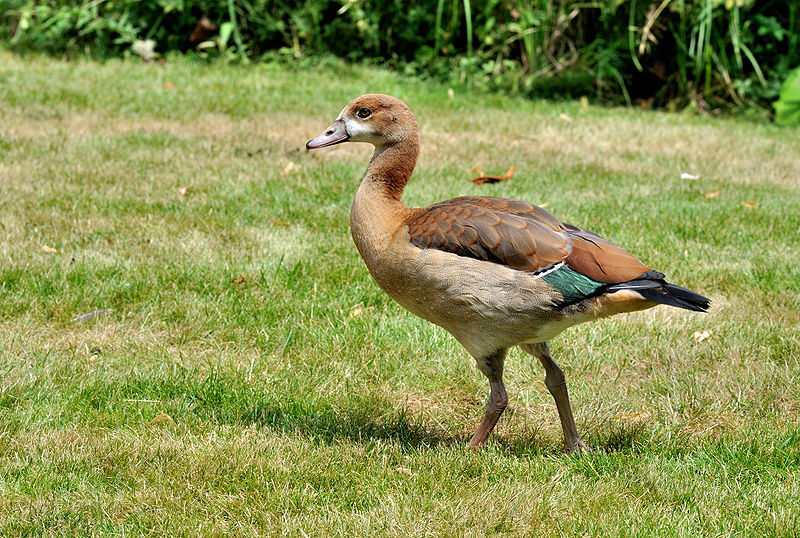 The birds are not Egyptian Geese, which are distinctive birds. The central pair facing left appear to be White-fronted Geese (Anser albifrons), and the central pair facing right are indisputably Red-breasted Geese (Brant ruficollis). Interestingly, the latter is a rare vagrant in modern-day Egypt. The outer birds are somewhat trickier – they could also be White-fronted (which don’t always have the white face markings) but they could be Greylag Geese (Anser anser, also not found regularly in modern Egypt). It turns out my readers were not the only people to notice and question this discrepancy. 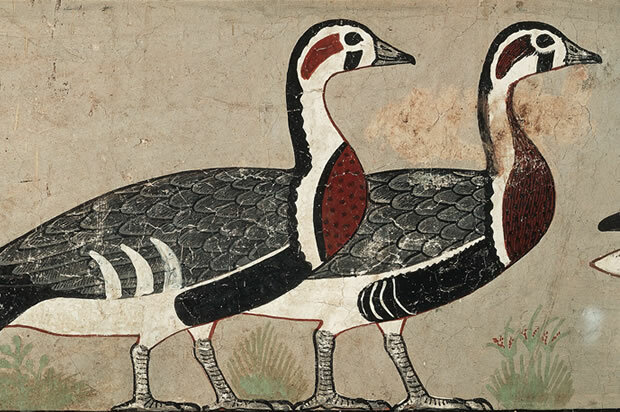 The painting (which is more popularly known as “Meidum Geese” since it was allegedly discovered in 1871 in a tomb beside the Meidum Pyramid), is one of the most famous in the Cairo museum—a masterpiece of the ancient world–but now, in 2015, experts are questioning its validity. This post from livescience.com by Owen Jarus describes how the painting is probably a fake, or, at least a doctored original. 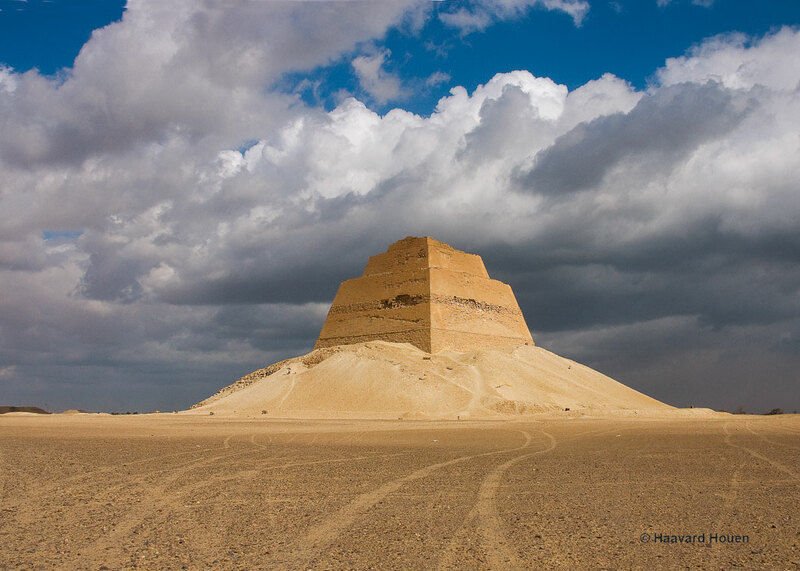 These charges are being leveled by Francesco Tiradritti, a professor at the Kore University of Enna and director of the Italian archaeological mission to Egypt. 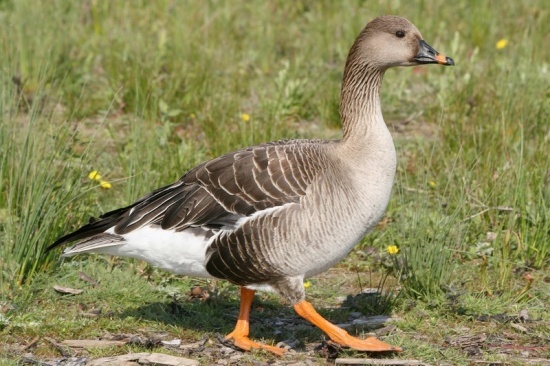 Tiradritti came up with yet another species designation for the left-facing geese as bean geese (Anser fabalis) a tundra goose, which certainly don’t belong in Egypt (even if the ancient climate were somewhat different). Now sometimes when I draw or paint (particularly when my subject is self-willed, like geese) I replace or invent some of the details with the magic of art (i.e. I make stuff up). Egyptian artists seemingly did the same thing—unless there were a lot of personified deities with animal heads actually roaming the Nile Valley. However the question of what sort of goddamn geese these really are caused Tiradritti to reexamine the whole painting with a fresh eye, and suddenly innumerable problems sprang to light. The naturalistic perspective/size of the geese in the painting is unusual for Egyptian art (although common in modern western painting). Also the colors are off. To quote Francesco Tiradritti, “Some of the hues (especially beige and marc) are unique in the Egyptian art. Even the shades of more common colors, like orange and red, are not even comparable with the same colors used in other fragments of painting coming from Atet’s chapel.” Perhaps most damningly, the fresco does not have the sort of cracks one would expect from a 4.5 thousand year old painting cut from a wall. This painting was discovered in 1871 by a colorful Italian archaeologist named Luigi Vassalli. Vasalli’s history is fascinating in its own right: he spent his youth as a revolutionary and as a portrait painter before being captured and sentenced to death for his attempts to unify Italy. 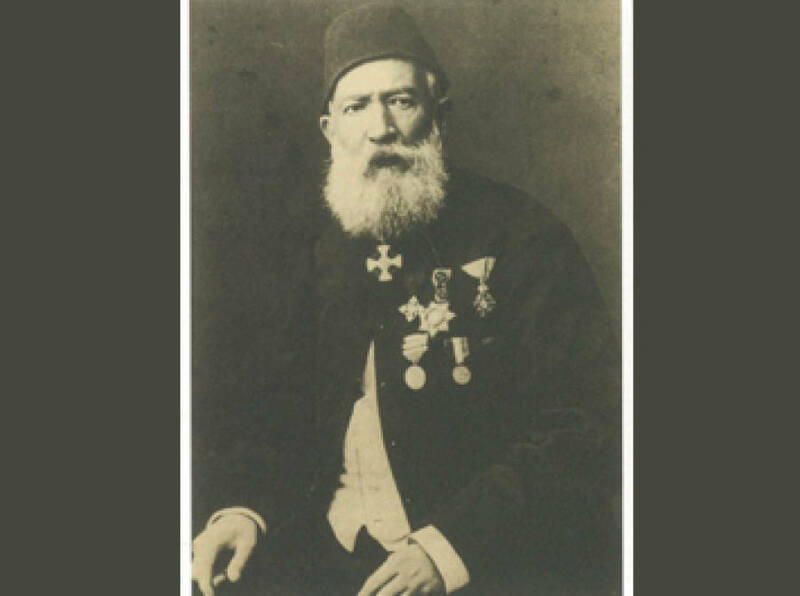 His sentence was commuted to exile, and he traveled Europe before finding his way to Egypt where he became an Egyptologist. He rose to be Egypt’s interim Director of Antiquities, but he ultimately died by his own hand. Vasalli was a great self-promoter and he exhaustively wrote/bragged about everything he found and did. Yet somehow he never wrote about (or apparently talked about) how he discovered “Meidum Geese”. Tiradetti reasonably posits that Vasalli painted “Meidum Gees” himself. Whether he did so as a joke, or for glory, or to restore a botched excavation is anyone’s guess. The allegations spawn sinister questions regarding the fundamental nature of art. If the geese were painted by Luigi Vassalli—who apparently also defaced an actual work to do so–we take away the designation “masterpiece” and instead label the work as a forgery. It is fair and right to strip it the painting of its accolades and to erase all the effusive words of praise written for it (of course I mean this figuratively: I am leaving up my old blog post so that you can see what I am talking about—but how empty my words ring, now). Yet what happened? The painting still looks the same. Does the fact that it was painted by a nineteenth century artist/revolutionary/con-man/scholar instead of an Old Kingdom artisan take all of its meaning and beauty away? Do the geese no longer look like they might hop out of the frieze? Do they now look oddly flat and childlike? Was the provenance all that made this work worthwhile? We live in an age when the appearance of authenticity means everything—in our art, our leaders, even ourselves. But what is left when the illusion of authenticity is taken away? Well, to make matters worse… the guy in the fez is actually Da-da. Otherwise, Da-da was highly unoffended by any errata, since he actually invented mistakage well over 515 million years ago, culminating in the breakup of Pangea. It’s not the years, it’s the mileage. Lookin’ stylin’…as has apparently been the case for quite a while. Where is my amused goose emoticon? Come on WordPress, try to keep up.